LureMaking.com is Canada's premier bead supplier to the Canadian and American tackle industry. Beads are one of the most important components for every lure maker. Lure manufacturers requires a large selection of beads at the ready. 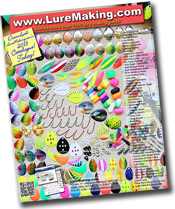 As you can see LureMaking.com has hundreds of different beads in a large range of styles, sizes, and finishes to meet the needs of every lure maker. Sleeve Beads - On Sale!